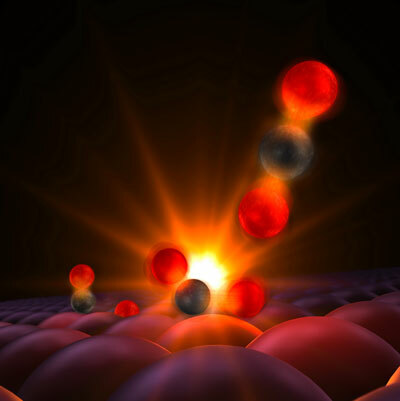 (Nanowerk News) Scientists have used an X-ray laser at the Department of Energy’s SLAC National Accelerator Laboratory to get the first glimpse of the transition state where two atoms begin to form a weak bond on the way to becoming a molecule. This fundamental advance, reported Feb. 12 in Science Express ("Probing the transition state region in catalytic CO oxidation on Ru") and long thought impossible, will have a profound impact on the understanding of how chemical reactions take place and on efforts to design reactions that generate energy, create new products and fertilize crops more efficiently. Anders Nilsson, a professor at SLAC and at Stockholm University, explains how scientists used an X-ray laser to watch atoms form a tentative bond, and why that's important. The experiments took place at SLAC’s Linac Coherent Light Source (LCLS), a DOE Office of Science User Facility. Its brilliant, strobe-like X-ray laser pulses are short enough to illuminate atoms and molecules and fast enough to watch chemical reactions unfold in a way never possible before. In the SLAC experiments, researchers attached CO and oxygen atoms to the surface of a ruthenium catalyst and got reactions going with a pulse from an optical laser. The pulse heated the catalyst to 2,000 kelvins – more than 3,000 degrees Fahrenheit – and set the attached chemicals vibrating, greatly increasing the chance that they would knock into each other and connect. The team was able to observe this process with X-ray laser pulses from LCLS, which detected changes in the arrangement of the atoms’ electrons – subtle signs of bond formation – that occurred in mere femtoseconds, or quadrillionths of a second. The researchers were surprised to see so many of the reactants enter the transition state – and equally surprised to discover that only a small fraction of them go on to form stable carbon dioxide. The rest break apart again. Theory played a key role in the experiments, allowing the team to predict what would happen and get a good idea of what to look for. “This is a super-interesting avenue for theoretical chemists. It’s going to open up a completely new field,” said report co-author Frank Abild-Pedersen of SLAC and SUNCAT. Preliminary experiments at SLAC’s Stanford Synchrotron Radiation Lightsource (SSRL), another DOE Office of Science User Facility, also proved crucial. Led by SSRL’s Hirohito Ogasawara and SUNCAT’s Jerry LaRue, they measured the characteristics of the chemical reactants with an intense X-ray beam so researchers would be sure to identify everything correctly at the LCLS, where beam time is much more scarce. “Without SSRL this would not have worked,” Nilsson said. “This is extremely important, as it provides insight into the scientific basis for rules that allow us to design new catalysts,” said SUNCAT Director and co-author Jens Nørskov.